ISK is one main throttle on activity in EVE, and the other is time. ISK is needed to purchase skills, ships, modules, replace losses, among other things. By time I mean real time, ticking away second by second towards a skill. I can’t do much about the time needed, other than make sure my skill queue always has something in it and be working towards a goal. As far as ISK, I don’t really have a good income source, so I’ve become preoccupied trying to figure one out. Ideally, an income source will be fun, will not dominate my in-game time, allow flexible scheduling, and is low-risk (at least while starting out). The more I think about it, the more the answer is Planetary Interaction. PI has several advantages. First, I do enjoy it. One of my favorite indie puzzlers is Space Chem, and I get a bit of that feeling making factories and producing stuff in EVE via PI. I haven’t done much besides produce P1 (processed materials), but I like it so far. Second, it occurs in the background and the ongoing maintenance is reasonable. Set up the colonies, figure out what to extract and process, let it run, collect resources later. Unlike mining, or grinding missions, or even trading, the ongoing maintenance is low. That’s ideal because when I do get a block of time to play, I can do other things like missions or exploration. Say I do find some low level PvP – it may be fun but it also doesn’t earn any ISK, so time spent doing that takes away from other “active” sources of income (mining, trading, missions, etc). But not PI, it produces while doing other stuff! Third, PI is a good balance between time spent, risk involved, and ISK earned. Especially the risk part, which is low for PI in high-sec. I’m sure planets are better in low sec or null sec, but I’m not in the position to go there. Fourth, PI is alt friendly. It doesn’t take long to make an alt character viable for PI. I have two other character slots that aren’t doing anything at all, and worst case they could be generating P1 commodities after an initial investment. My single colony is doing well – it has produced about 1 million ISK of toxic metals, a P1 (processed materials) resource. It hasn’t required too much upkeep, so I’m very interested in trying PI on more planets and producing higher level goods, P2 (refined commodities) and up. Overall, Planetary Interaction is the most ideal form of income I’ve come across. I will be testing that over the upcoming weeks/months. Therefore, I’m going to be running colonies/factories on planets, for the foreseeable future. Due to initial startup costs (skill books and buildings), I’ll be even poorer in the short to medium term, busy recouping the initial investment and plowing profits into PI on more planets, but over time that should turn around. I’ll update with how it’s going every now and then, and get back into playing other MMOs in the meantime. 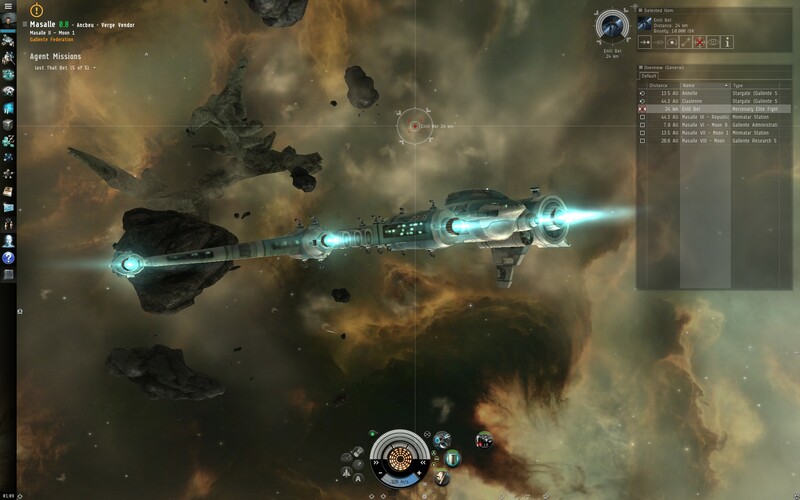 I enjoy reading other MMO blogs – especially ones focused on EVE. The game has a famously steep learning curve, and reading other adventures gives me ideas about what to aim for. Plus, I pick up tidbits of info even though I’m not really in a position to use them. Anyway, here are a few of my favorite EVE blogs, and some random thoughts about recent topics from those blogs. One of my favorites is Tiger Ears, a blog by a wormhole explorer. I can’t follow all of what he’s up to, but Google helps make more sense of it. Someday I would like to be that handy exploring, scanning, and hopping about unseen due to cloaking. Another interesting read is Low Sec Lifestyle, which covers a variety of topics. A recent post was on Exploration and some of the upcoming changes. Jester’s Trek is also quite good, however as a new player, much of the topic matter is beyond me. For example, the FOTW (fit of the week) posts – I don’t have any of those ships or modules, but maybe later I can use the info. Cheradenine Harper, at Diaries of a Space Noob, is interesting to follow as a new player too. I was especially curious how he earned ISK, and it appears he started out mining, at least for the first 60 days, then manufacturing, and now some planetary interaction. Finally, Gevlon at Greedy Goblin, is the perspective of a dedicated trader. That sounds deathly boring to me (buy low sell high haul stuff from A to B) however Gevlon is apparently an EVE trillionaire, so it does work. I’ve tried exploration, and it was fun. It also took longer than expected and I lost a ship and some modules, so it was net negative ISK overall. So I read Sugar Kyle’s post with great interest. She noted that exploration favors Tech 3 Strategic Cruisers, which I find very dismaying because those cost ~255 million ISK, a very large amount to me. Gevlon is on a crusade to kill ice-mining bots, since those reduce profits. Apparently ice mining is quite profitable, but is it too expensive for me to start. Plus, it is mining (yawn). Actually, the bare minimum ISK needed for ice mining is attainable, but I’d rather do something less dull for income. For example, Level 1 distribution missions even if I only earn ~300K ISK/hour. The “Conflict of Self Interest” post on Jester’s Trek is a great read, especially the comments. It covers a bunch of issues, from ganking to how to encourage more PvP to other issues. I can’t speak for other players, but I know that for me, I avoid PvP and low/null sec purely for economic reasons. Simply put, I don’t have enough ISK to afford replacing ships, nor do I have the income stream. Plus, EVE PvP can be wildly asymmetrical. For example, I was ganked in low-sec by a Tengu, a Tech 3 Strategic Cruiser. It was a volley of 4 missiles, each of which cost more than the ship I was piloting! There’s no defending against that, it isn’t an equitable (trying to avoid using “fair” so I don’t imply that using an advantage is bad) fight. EVE vets might be proud that PvP is non-consensual, but that also implies equitable battles are voluntary. I’m going to guess without any proof that the typical PvPer doesn’t first scale their ship down to match a weaker unsuspecting victim. I’m not sore about the gank, I know low-sec is risky. However, as a result of this and my low ISK wallet, my behavior has changed – I don’t go into low-sec anymore; I can’t afford the losses right now. Newer players are at an enormous disadvantage in PvP. It isn’t possible to bridge it, except through time and ISK, and perhaps extra help (corporation members). It is like a boat race where once side gets to use a yacht and one side gets to use a rowboat. Except the rowboat owner has to buy another one after each loss, because the rowboat is destroyed. In that situation, if all I have is a rowboat and can’t afford too many replacements, I’m going to avoid racing altogether until I can at least afford my own yacht(s). That’s what I do – avoid PvP as much as possible – right now. The simple fact is that every single EVE player in the game is impacted by how easy or complicated the POS system is. If you’ve ever bought a T2 ship or module, ever flown or been supported by a super-capital ship, ever hidden in a POS shield from your enemies, ever mined in a system with no station using a POS as your storage location, or ever been a part of a null-sec alliance, you are impacted by the POS system. That, as far as I can tell, is everyone. I’m special! Apparently I am not at all currently affected by the POS (player owned starbase) system, because I am not in any of those categories. I have no T2 ships – my fanciest ship is a T1 Destroyer, the Catalyst; I have not flown or supported a super-capital ship – I’m certain I’ve never seen one; I have not hidden in a POS shield – I’m certain I’ve never seen one; I have never mined in a POS-only system – all my mining has been strictly for high-sec missions; I’m not part of a null-sec alliance or any-sec alliance for that matter – I am in the NPC corporation each character starts in. I have been blind-invited to join a few corporations, but I decline because I play too inconsistently and too-few weekly hours to be a good corporation member. If Syncaine is representative of what an average corp wants as far as weekly availability, let’s just say I’m going to be a soloer. 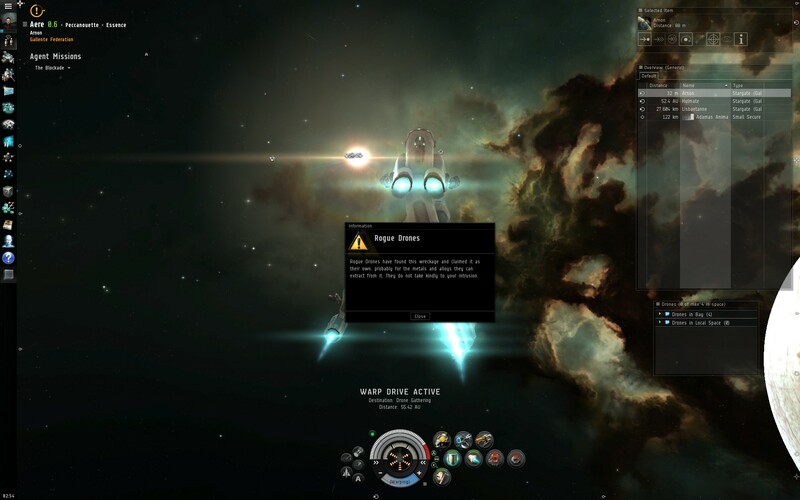 One of the ways EVE is unique is that losses suffered are actual ISK lost. That last part is a major impediment to me doing much in game (right now)… I don’t have much of a rainy-day fund to replace losses. It’s kind of like being in a casino with a $10 bankroll – I’ll have to stay at the $1 tables. I can see others at the $100 tables, and they are eating better food, have more choices of table games to play, and sometimes they even point out how much more fun they are having and probably think I’m nuts for staying at the $1 table. But the thing is, they are all millionaires and maybe don’t relate that well to people who have a smaller checkbook. Anyway, to make up for some terrible analogies involving boat races and casinos ;), the next post will be on what I think will be my best income source. I finally got around to trying out Planetary Interaction. I watched the video CCP made, a really good video from EVE University, and still had some questions. Like many things in EVE, after learning enough to not feel totally lost, it is best to plunge in and try it, rather than suffer “analysis paralysis”. 😉 Besides, in high-sec space I’m really just risking a bit of ISK for building, not expensive ships and modules. So I built a colony, muddling through the various options, building, routing, etc. My setup is below. It is terrible, as far as building placement, distance to resources, etc. I know that now, and am already figuring out how to do better! The initial attempt was on the closest planet I could find, an ice planet. I built my Command Center in between two resources, thinking I’d harvest both. That was a mistake because building a route (pipeline) was too expensive. As a result, the single resource I could then harvest was comparatively far away. Oh well, chalk this up to figuring things out. I built the Extractor Control Unit on the edge of the resource, which was heavy metals. Then I built and positioned 4 Extractor Head Units, fiddled with the program and installed it. For some reason I can’t explain, I then build the Basic Industrial Facility far away as well, on the other side (route-wise) of the CC, which let me use the CC to buffer resources. I set the BIF to produce toxic metals from the heavy metals input, and route the result to the CC for storage. My little colony was off and running! Despite being a terrible layout, my colony produced just under 2000 m^3 of toxic metals. Light searching on the market tells me these will sell for about 650K ISK. Not that much by other standards, especially considering I had to upgrade my CC to handle the power requirements due to bad layout (so the initial run basically payed for the buildings and upgrades, with a minor loss) but over time I can see a small profit. Besides, it was kinda fun doing this. My PI skills are low so I’ve switched over and am training those up. While that is happening, I figured I could get another run out of my ice colony. So I built more EHUs for attempt 2, set the routing, and kicked it off. I’ll check in every day to launch/pickup the product (toxic metals) and sometime soon I will search for other planets and try something more elaborate. However, I’ll probably produce and sell toxic metals for a while in order to build up more of an ISK buffer. I’m hoping that once I get squared away with a reasonable planetary factory going, I can slowly build up ISK for doing other fun stuff like buying ships, skills, modules, etc. All this stuff is expensive (to me), for example I’d like a bigger ship like the Vexor cruiser, but that’s 10 million ISK. A tech 2 exploration frigate, such as the Helios, is 20 million. Then I need skill books (cloaking), modules (cloaking), and be able to suffer some losses along the way. Even if I could afford a 10 million ISK ship, it would be stupid to buy one if a purchase like that wiped out my wallet. I really need more like 4 or 5 times as much as the total cost of the items (i.e. if I want to buy a cruiser plus skills/modules, it isn’t really 12 to 15 million I need, it is more like 50 to 75 million ISK. That way I can take a loss or three without bankruptcy). Heck, just getting the items together so I can mine ice costs ~12 million ISK at the low end and 200 million on the high end. It’s just expensive to do stuff in EVE! I got busy and wasn’t able to play EVE too much lately. What I made sure to do, was to keep my skill queue chugging along. I decided I’m best off training new skills to level 2 or maybe 3 depending, and then getting key ones to 4 and a select few up to 5. Navigation to 5 was one, since that speed bonus applies to all ships and the skill is a X1 multiplier. I’ll train Mechanics to 5 as well, because that boost a ship’s structure hit points. I’ll probably train Engineering to 5, for the extra power grid output. My plan is to get all the Engineering skills to Level 4. They all have to do with capacitor usage and energy, and I hit limits quite a bit. So a few percentage here and there will help, even if it isn’t hugely obvious. Then I’d like to get the other Navigation skills to Level 4. I was going to train my Gunnery skills more, but I’d like longer range weapons. My Small Hybrid Turret’s optimal range is 10 km, with a falloff at 18 km. Even maxing out Sharpshooter won’t increase the range that much. I’m thinking of going into Missiles instead. What I’ll probably do is train up the various Drone skills to Level 4, since I’m Gallente after all. Maybe after that I’ll decide on Missiles vs Turrets. I moved to another system, because I got tired of undocking in Arnon and seeing all the canisters labeled “free stuff!” and “don’t open the free stuff, its a scam!”. I get it, new players are drawn to Arnon for Blood-stained Stars, and some players lay traps, hoping to catch other “stealing” stuff so they can blow them up. Awesome… time to move somewhere else. Gevlon is always posting about how profitable Ice Mining is, so I thought I’d check it out. As always in EVE, checking out a game mechanism means Googling for the info first, and reading up on it. I found a great page on Ice Harvesting on the official wiki. (As a side note, as complicated as EVE is, the official wiki and the EVE University wiki are fantastic sources of info). It lists skills needed, modules, and ships. Good thing I didn’t fly out to a system with ice and get stuck trying to figure out why my mining laser wouldn’t work. That’s a grand total of 11.5 million ISK to start ice mining, which is about double the ISK I have. 200 million ISK! That’s a mind boggling amount of ISK. Sorry all you wealthy EVE veterans, I’m somebody who was thrilled to have 11 million ISK after the Blood-stained Stars, and currently has ~6.5 million ISK. That’s an astronomical (har har) amount to me. I thought I’d try some Level 1 Distribution missions to slowly build up ISK. I don’t want to spend every ISK I have on ice mining stuff, because if I lose it them I’m screwed (fly what you can afford, etc.) and I don’t want to sink everything into an unknown venture (maybe I’ll hate ice mining). So at the station I picked up a mission. It started with delivering air to another station, then tourists to another station, and then I received a 5 part mission linked with a theme: dolls. Yes, dolls. The first 2 missions were to courier dolls around, no problem. The 3rd mission was to retrieve 4 dolls, each placed in a container near an acceleration gate. Sort of a scavenger hunt except the item is the same and where to look isn’t a mystery. The 4th doll mission was to find the doll buried in an asteroid field. This meant mining all the asteroids until the doll appeared. Weird, but whatever. This particular payed well, 204K including the bonus of finishing in 3 hours. I found out why… it turns out it is a little tedious to mine 25 asteroids (all of which produced 1 Veldspar), looking for a doll. And midway through, 2 Serpentis Spys showed up. Finally, after the last asteroid was mined, a cargo container appeared. I bet that’s only triggered to occur when the last asteroid is finished. Anyway, the doll was there so I grabbed it and returned to the station. The mission after that was to kill the guy hiding the dolls all over. Macabre, but fitting. I flew out and discovered the miscreant hiding in some debris, and made short work of him (switching over from my Imicus to Catalyst). This entire sequence paid me 493K ISK (reward plus bonus for each) and took about 95 mins. That works out to ~311K ISK per hour. At that rate, I could build up the ISK for the Procurer, Ice Harvester, and skills in around 4 weeks. I want to measure what Security missions pay too, as an hourly rate. For me, a lowly newbie player. Just curious. I decided to mix things up and go exploring. So I undocked and orbited the station at Arnon, and scanned. And scanned, and scanned… and after about 10 minutes of finding nothing at all, I moved into the adjacent system, Aere. 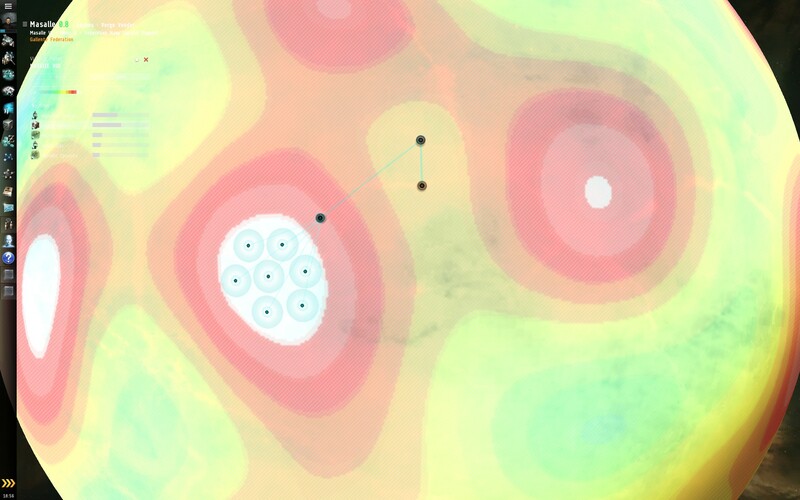 Once there I also scanned 3 or 4 times and finally found a Cosmic Anomaly. I was hoping for a Radar or Magnetometric site, but after about 20 minutes of scanning I wanted to do something. So I warped out to the anomaly site, receiving a notice about rogue drones. 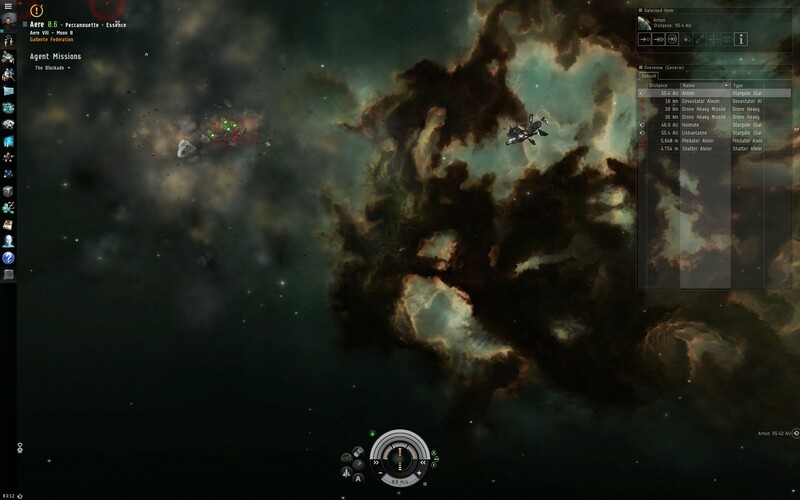 Initially, the cosmic anomaly was 2 drones and 2 drone heavy missile batteries. I warped in 30 km away, but the missile batteries already started firing on me. Nice range, I wish I had that! I was flying my Imicus, and I had 4 Hogoblin drones on board, so I deployed them. I got a little closer, in order to target an enemy, and ordered the drones to attack. Due to damage from the heavy missiles, I warped away, recalling my drones first. Safely out of range, I self-repaired by waiting around for my capacitor to charge enough to run the small shield repair unit and the armor repair unit. That’s cheaper than going to a station, but takes longer. I went back and did the similar attack and run. Kinda seems familiar to me now from the Security II missions. I eventually killed two drones, and another wave appeared. Argh! The missile batteries were still there, pelting my ship. I ran and escaped another time or two, but eventually… you guessed it… I did’t get away fast enough and lost the Imicus. So I warped back to Arnon in my pod (sigh…) and got in my Catalyst which can fight better. I cleared out the missile batteries, and still had 4 more drones to deal with. I warped in 50 km away, and was able to approach the wreck of my Imicus and open the cargo, saving some of the modules I had fitted. I am disappointed that the Codebreaker and Analyzer seemingly vanished (destroyed in the explosion I suppose), but I did at least retrieve the Salvager, Small Shield Booster, and Small Armor Repairer. I fought those 4 drones, and another 5 showed up. I decided to run and consider my option while repairing armor/shields in space. I wanted to go retrieve the hobgoblin drones which needed to be “scooped up”. That apparently means getting close to them, but that in turn meant dealing with 5 more drones and however many more appear after that. I also wanted to salvage the wrecks of the drones I killed. But, this took a lot longer than I planned and I also wanted to get to sleep. I went back in with the goal of taking out the new wave of 5 drones, and if more appeared, I would just abandon the anomaly altogether. Fortunately, no more drones appeared, and I was able to spend the time in my Catalyst scooping drones and salvaging wrecks. That alone took nearly 20 minutes of flying around to get within range of all the wrecks, and then waiting for the salvage process. I know several things so far. I think I’m not totally incompetent, but EVE got noticeably harder once the tutorial missions and intro storyline arc finished. I can’t realistically fight enemies that can hit me from 30+ km away when my weapons (small hybrid turret) have an optimal range of 10 km and a falloff range of 18 km. Especially 4 or 5 on 1, which is about the ratio I’m seeing out there. If I want to keep doing combat missions, I probably need to train up missiles instead. Then I can be the pilot lobbing from 30 km away. Or figure out how to get longer range on turrets. EVE is tough for me to schedule. The time I set aside might not allow me enough to recover from a bad mission. That is true in other games as well, however in EVE, losing stuff costs in-game currency to replace. That fact that I’m not exactly swimming in ISK means missions are extra risky. This simple Exploration attempt took nearly 2.5 hours total, including the time spent scanning and finding something, the fight/repair cycle, and the lengthy salvage process. I’d like to try more Exploration, but combat is problematic, especially in my scout ship (the Imicus). I can’t fight in that thing at all, it can’t fit much and is pretty fragile. If Radar or Magnetometric sites entail combat, I’ll have to do them in a destroyer. It was so late by the time I finished, and I was so tired, I’m not sure I looted everything I could. 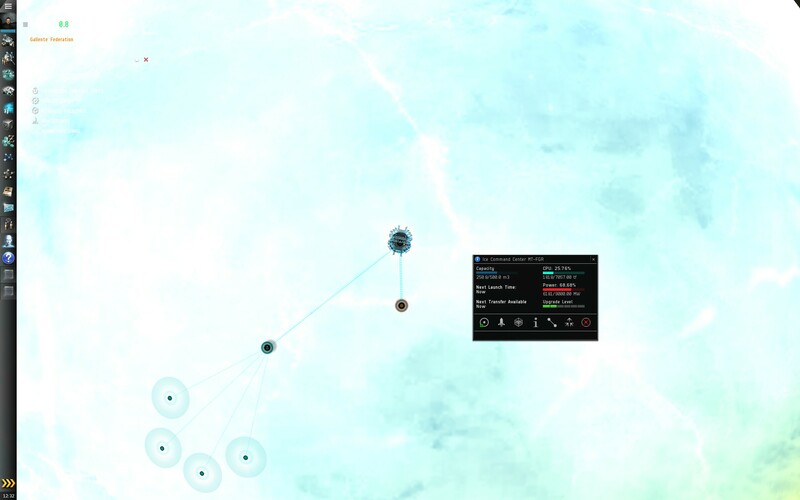 There was a spaceship wreck in the middle of the anomaly cloud, but I couldn’t salvage it. I didn’t think about trying to open it as cargo, or doing that to much else for that matter, until I had already logged off. Next up to try out is Planetary Interaction. I hope it goes better! I tried 3 Security II missions, with mixed results. For the first one, I had to run away a few times to avoid getting destroyed. It lengthened the fight a bit, but in the end I defeated several waves of attackers and hung around to salvage their wrecks. Net profit was nearly 1 million ISK, between earning the mission payoff, mission bonus, and selling stuff I salvaged. The second mission was much tougher, featuring a sensor dampening tower I could never get close enough to blow up. The mission was to break a blockade, and I lost count of the number of waves that showed up, at least 4 or 5, each consisting of 5 or 6 enemies. Most of the time I could only defeat one or two before I had to dock to repair. Unfortunately I was overwhelmed in one of those waves and lost the Catalyst. That hurt given I only had about 8 million ISK at the time. I had insured my ship, but after purchasing another one, purchasing the modules (salvager, 6x150mm railgun, small shield booster, small armor repairer), and of course repairing so many times, I was down quite a bit of ISK overall. After getting setup again, I went back and tried to finish the mission. When I had the group that killed me down to 2 or 3, another huge number warped in! Once again I was overwhelmed and lost another Catalyst. This mission was just tedious and miserable, not fun at all. I gave up due to running out of time (real life, not in-game for the bonus) – after returning to the station to repair for the umpteenth time, I just logged off. It would have taken another hour or more, to grind down the numbers one by one, and I didn’t have time to do it. I googled around and found this mission: The Blockade. Apparently it is quite difficult. This mission was easier than The Blockade, but I still had to run several times. Unfortunately the system the mission took place in didn’t have a station with a repair facility! So for those times I left with a stream of smoke and fire from my ship 😉 I had to jump through a gate to then dock/undock and jump back. Time consuming but better than losing yet another ship. In the end, after all the salvage, I probably broke even due to repair bills. I didn’t score a valuable salvage item like I did in the first mission. At least I got the payoff and bonus for completing in the time limit. I do like the risk in EVE’s design, but the downside is that I can see myself falling below a viable amount of ISK needed to actually play the game. There is a difference between undocking with risk of loss, and undocking with risk of insolvency. I don’t expect quick and easy wealth – I’m just trying to accumulate an amount of ISK where the loss of a destroyer isn’t a major chunk of my wallet. To that end, I’m hoping Exploration or Planetary Interaction will be the right mix of fun and profit-risk balance. At least enough to let me build up an ISK cushion. If not, then I guess I’m stuck with Level I Distribution or Level I Security missions, and that is not a strong appeal. Mining is to dull for me to do (sorry, there are too many other games to play than to waste my time watching my ship flying orbits around an asteroid). R&D missions are too expensive, and from what I read they don’t pay much anyway, so those are a no-go as well. Trade is another option, but that also doesn’t appeal much either. 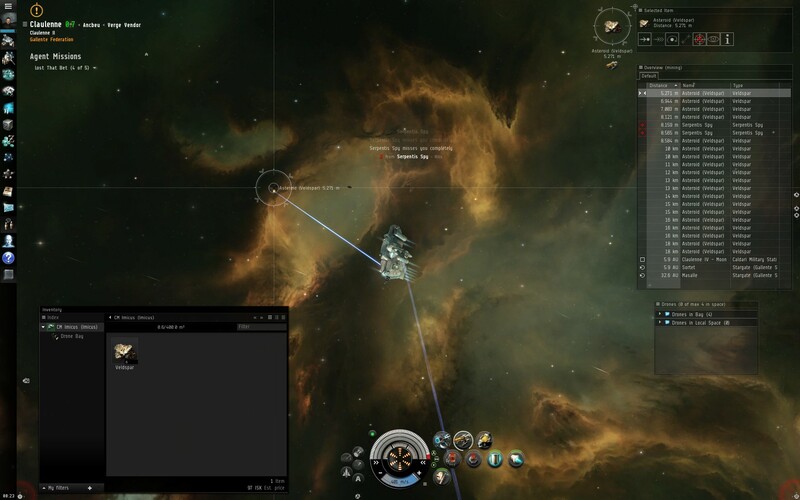 This is EVE Online, I want to do stuff that involves flying spaceships, not sit in a station buying and selling items.